Rastafarian Zimbabwean: Happy Birthday Emmaye!! 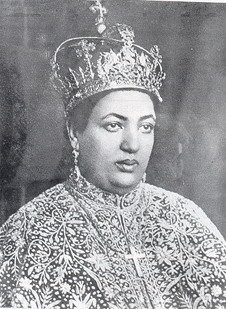 No greater example of the deplorable state of the Rastafarian community can be contemplated than the fact that it appears that no one remembered the Birthday of our beloved Emmaye, Her Imperial Majesty Empress Woleite Giorgis Manan Assefaw of Ethiopia, Queen of Queens. Not even the sister who rang me up to whinge about how all the other sisters have gone astray, even though she herself is to be found wanting because of her own passiveness. That we have elections around the corner is not an excuse. I asked around, and it seems that many people do not even know who Empress Manan is and cannot connect her to the "Queen Omega" they parrot from the reggae records. Manje so. Could this lack of knowledge of Empress Manan be behind what I see as a total failure of the Zimbabwean Rastafarian woman to stand up? Surely, any one reading Psalm 45 would see that Her Imperial Majesty is attired in the gold of Ophir....which land we now call Zimbabwe/Southern Africa. Gold is a symbol of wealth, it is also a symbol of purity. The Amharic word for gold is sometimes written in English as work. And this is what I would like to see- the work of the Rastafarian woman in Zimbabwe, the glorious mantle that adorns the Queen of Queens. I would so much like to see this that I have pledged a sum of money for women's projects. That was nearly 3 years ago, and to date no one has approached me for it. So what does the Birthday of Her Imperial Majesty mean to me? It is a time to reflect on the meaning of Rastafari Womanhood, and my own role as a man to relate to this. There may not be any Rastafarian women for miles around, but Empress Manan keeps me clear in the knowledge of what a Rastafarian woman is all about. When I do come across one,I will know.